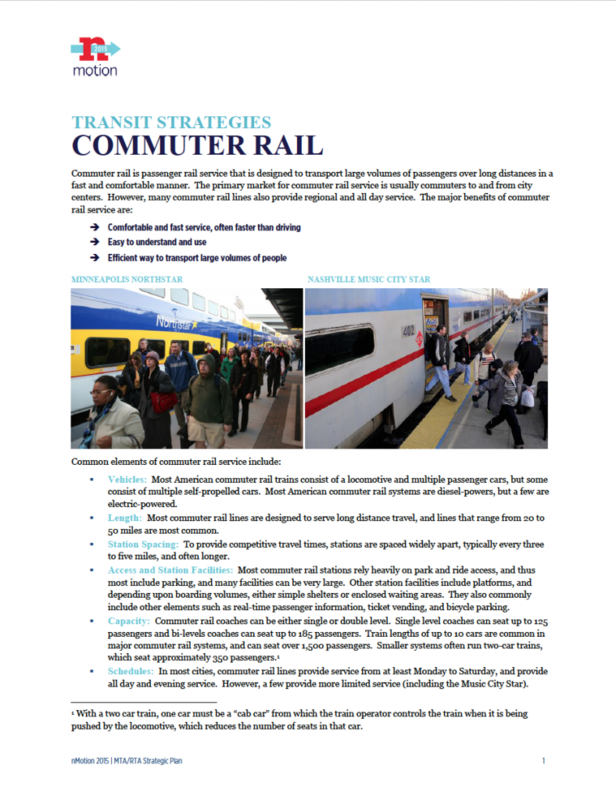 This report in the Transit Strategies Series explores commuter rail. Commuter rail is passenger rail service that is designed to transport large volumes of passengers over long distances in a fast and comfortable manner. One of the challenges to the development of new commuter rail lines in Middle Tennessee is that the most desirable rail corridors are CSX lines that have very heavy freight traffic. Except for the Nashville and Eastern line that is used for Music City Star service, and with the possible exception of a Clarksville line, other potential commuter rail lines would be CSX lines that are heavily used for freight traffic. It will be extremely difficult to significantly expand commuter rail in Middle Tennessee in the foreseeable future. Longer term, this situation may change. What do you think? Understanding the current challenges of expanding commuter rail in the region, what alternatives should Nashville MTA/RTA consider? How could RTA improve Music City Star service? What does RTA need to know as they consider rail service between Nashville and Clarksville as part of the Northwest Corridor Transit Study? For anyone developing this plan, it is a good idea to browse through the responses over at the East Nashville Google Group (and others). The responses from those adamantly opposed to this and pretty much all other plans related to public transportation in Nashville are important. They are important simply because winning someone like that over in this argument will more likely allow any plan to move forward much more easily. I adamantly believe in the expansion and reasonable exploration of all public transportation options in Middle Tennessee and this idea, though expensive, actually seems pretty cheap to me. This is especially true considering all the things it will do that only grow in cost the more time passes. In any case, I encourage anyone on this plan to browse that forum and seek to understand and attempt to empathize with those on the other side of the fence to garner their opinions: some opposed to this have zero ideas to use instead; some simply think Nashville should not change; some complain constantly of the deplorable state of bus stops or the ridership and the riders, such as the homeless or rider harassment; while others simply do not have any real opinion other than “6 BILLION!! TOO MUCH!! TAXES!” and so on. Those people still vote and live in this town and attempt to organize around their opposition, example: AMP. They do not need to be defeated as that is absurd: they live here too and their opinion is important no matter how adamant and unflinching in opposition it may seem. In order to be convinced of any plan for public transportation, they first have to be heard or at a minimum, felt heard. I urge Mayor Barry as well as those organizing this plan to do something to speak directly to this opposition voice. This seems like it would be of big interest to the Chamber’s big business investors! Downtown hotels are struggling to get workers since all of them have been forced out of the urban core by skyrocketing rent. Hospitals and universities must get their staff to work on time. Distribution centers like UPS and Amazon would save lots of money by utilizing this for staff and moving of goods. Housing developers and real estate professionals would profit from even higher asking prices due to access to transit. The Titans, Predators and Nashville Sounds would all get more people to their games, making even more profits. Live Nation would profit from higher ticket sells at Ascend, Bridgestone Arena and Municipal Auditorium. Opryland Hotel and Oprymills would definitely be on the receiving end of the financial benefits from this. The “Entertainment + Tourist” district would actually be able to get locals to the area. All of the large downtown law firms and companies could save on employee and visitor parking fees. Metro Airport Authority would profit from more international flights and airline hubs. Large tech companies will be providing the costly programming and tech needs no doubt. It seems like a no brainer to ask the Chamber and their big investors to provide the majority of funding for the infrastructure costs of this bold, costly plan. Especially since their economic development strategy is solely focused on attracting even more businesses and people to our city. Otherwise I think many residents will choose to stop the growth for growth sake cycle and find affordable and practical solutions to our traffic congestion. Like not drastically increasing density, focusing on small business policy and lower cost of living by not injecting the market with subsidies and incentives for short-term investments. But I do look forward to hearing how they plan to pay for the build out, continued upkeep and operating costs of a system that will most benefit their investors! connect to franklin and murfressboro. It would take riders off the road and college students could experience more areas of town. I have studied transportation geography and lived in an area of failed public transportation (Sacramento) and I can say from experience that a poorly planned light rail is worse than no light rail. Personally I think Nashville would be wise to seriously consider the bus-rapid-transit models of Europe and South America. Moves a comparable (if not larger) volume of people at far less investment of dollars and land. Can be built out quicker and is far more reactive to scheduling needs too. I currently commute on the RTA 35x and am grateful to have it available. Charlotte Pike needs a rail. It is already very busy and they keep building more and more apartments which will add even more traffic. Something needs to be done about this pronto. Stop building more apartments and encouraging population growth, which is increasing housing costs and decreasing our quality of life. Stop using corporate welfare to encourage businesses to relocate to Nashvile. We’ve past the point of diminishing returns. I recommend investing in more electric trains. It reduces greenhouse gas emissions and shrinks the required amount of space the conductor needs to control the train allowing for more passengers. Nashville and surrounding communities are no longer ‘sleepy little towns’. Middle Tennessee has grown and promises to grow much more in future years. In my opinion now is the time to start preparing for what the future is going to bring … more people, more housing, more shopping areas, more business, more manufacturing, more traffic … MORE. Our roads are handling almost as much traffic as they can. Our ability to continue building roads that can handle the increasing number of cars is diminishing. Public transportation is the only answer that makes any sense. Instead of trying to use existing rails and shared rails that restrict passenger train options, design a complete system from portal to portal that handles the existing and future projected growth. Cost out the system and set priorities by lines which have the most potential riders and then tax us. Build the system the way it should be built. Citizens do not mind paying for a ‘good thing’. They/we mind paying for something that is sold as great that turns out to be short in supplying the services we need and expect. Be brave. Be bold. Design first, prioritize implementation based on return and ridership, establish a transportation tax and build the system. In my opinion all other approaches create something less than desirable. I’d like to see us be brave and bold and reconsider whether the idea of constant growth, which Nashville’s leadership class seems to have embraced, is really a good thing and if it is compatible in any way with the notions of environmental and community sustainability. I think a commuter rail is needed much more for Murfreesboro than Clarksville. I drive I-24 south from Clarksville to Nashville frequently on Monday mornings and the traffic is pretty light. I-24 north from Murfreesboro is a mess every morning. Thank you for your comments, Bob. This route is being heavily studied for potential transit solutions. I agree I-24 (MFB, Smyrna, LaVergne) to downtown and I-65 (Hendersonville, Goodlettsville, Madison) to downtown Nashville needs and I-65South from Franklin to Nashville. This would help with traffic issues. We currently have the rail running from Mt. Juliet to downtown, but that is still not helping because the trains on not that often and after you get into downtown you still have to find a way to your job if you not working downtown. CSX often has heavy freight that travels through the midstate. Here’s the other issue, the traffic in the midstate is horrendous. Nashville and surrounding counties have to have commuter rail in order to alleviate traffic woes. The powers that be should contact the powers that be with CSX in order to work out a solution or negotiation for use with the tracks. In the 1970’s, Amtrak had a stop in Nashville and Murfreesboro traveling between Chicago, Illinois and Miami, Florida. What tracks did they use and how were they able to operate during that time period? CSX was prevalent in the area then as well. The Music City Star seems like it is a great commuter rail but place those trains where there needed more: The I-24 Corridor and I-65 Corridor. These areas are in desperate need of relief when it comes to transportation issues. Thank you for your comments, J.R. These routes are being heavily studied for potential transit solutions. We are proactively maintaining communications with CSX to explore opportunities for collaboration in the future. Any solutions for these corridors will require a multimodal approach and coordination with different players in the public and private sectors. Why does CSX get a pass with respect to “Public Domain” and serving the good of the community by acquiring tracks? It seems that CSX has already told you NO when it comes to existing track space or rails. And you state that “…middle Tenn. freight traffic is so high…” to even think about sharing tracks. TELL them they WILL put some skin in the game!!!! You wouldn’t hesitate to take my farm, my house, my trees for the “Public Good” no would ya? Expanding the Music City Star service is a terrible idea until they work out the issues it has now. I have been riding pretty religiously for about 8 years now and the bus routes that take us to the trains have been getting mired in traffic more and more often. We are very often late for work, and MORE often miss the train departure, meaning missed kid pick ups, appointments, school events, etcetera. If you almost as often as not miss the train because the bus can’t get to it in time, the train no longer becomes a good way to get to work. We can’t put more people on the train until we get a truly reliable way to make the entire route work for the existing users. If I have something truly important these days, I have to drive, which is super disappointing. A lot of us regulars will skip the train if there is a big concert or game, because we may not get home until 7:00. More times, trains, and routes sounds great, but the one we have now ISN’T WORKING. At least not consistently. Thank you for your comments, Nolo. Bus route circulation around downtown that is efficient and dependable will be key in order to make regional services work. We have been exploring potential strategies for this that are also discussed on the Better Downtown Transit Service and Transit Priority strategy papers. We invite you to review those and let us know your thoughts. I love the plans I’m seeing here but a little disheartened that it doesn’t extend out to the Hendersonville/Gallatin areas. These areas are growing VERY fast and I for one would love to see rail come out that far. I think it would do wonders to help expand that corridor’s population as well. Agree. Needs to cover as much of the region to make it financially feasible. Has anyone considered laying additional lines next to the existing train tracks and designate them solely for commuter rail? I love the idea of commuter rail and think that is so much better than even considering adding more buses. The trains should be electric, so they don’t add to the air pollution like the diesel buses do. Adam Carroll’s design looks great! Would like to add an extension of his “blue line” to Bellevue though. Combination of light rail from the suburbs, trolleys in-town and rapid bus routes would really help the traffic fiasco that is just getting worse everywhere. In my opinion having commuter rail is mandatory for NASHVILLE to grow successfully into what it is now attempting to grow into. The option I see is a light rail that runs down the center of all interstates to downtown with stops along the way. An elevated monorail is an option. The MCS is ok but it runs a limited schedule and is expensive. It is for work commute and that’s it. We need a system that runs every 30 minutes all day. In conjunction the MTA needs to run horizontally between lines. As it is now you have to ride to downtown to change lines. Very hard to coordinate that way and very hard to get anywhere fast. We have transplants from big cities who are used to rail and will use a rail that is effective. Commuter rail into northwest Nashville would be great! We also need improved walkability with trails and sidewalks to make it possible to get to public transit resources safely. If I don’t feel safe walking to a bus or train stop because there are no sidewalks or trails, I’m more likely to take a car. Adams Carroll map looks amazing! I am not an expert, but I know that we need a better system in order to attract riders. The hassle of slow infrequent buses is a huge negative. Light rail, whatever, we need something that is well thought out –and the sooner the better. I echo the sentiments of David Utley on the magnetic levitation (maglev) concept. Thanks for this forum. Yes, we need a light rail system similar to Portland, Oregon’s. Everyone there takes it. We lived in DC for 30 years and the metro was the only way to go. We need a light rail system in Nashville. Thank you Jim. We’ll be releasing a strategy report on light rail soon. Please check back. The best means to move large numbers of people into and thru Nashville from outlying cities is a modern Mag Lev trasit system. Support for a MagLev system is all that’s needed, private funding is available and ready now. We could begin to see operations within two years. Rail may appeal to many folks but the modern MagLev provides benifits beyond what rail offers. The biggest is reduced maintenance costs and over time. Recent developments in the North East corridor to build MagLev between New York and Washington DC would mean Tennessee could keep up to date by including MagLev transit as part of the transportation options in the region. I believe that light rail is the way to go. We should not try and share tracks with CSX, that will cause too much congestion on the tracks and I assume those aren’t setup for high speed trains? Could we not include adding a rail system to the center of the interstates as we do expansion projects around the city? Or build some sort of elevated rail down the center of the interstate? I am not sure how that works or if that is even feasible, just throwing out ideas. I am sure doing any kind of subway underground would be near impossible for a number of reason. I also think we can’t be limited to using the CSX tracks and buses are out of the question because they get stuck in the same traffic as cars do. I still feel like some kind of light rail will be what needs to be implemented. Thanks for your comments Eddie. A strategy report on light rail will be released in the next few weeks. The CSX dilemma is a big one. I don’t understand how the right-of-ways work on rail lines, and would appreciate more data on the relevant laws and issues in the Middle Tennessee region. But it’s evident that if we’re going to have sufficient rail infrastructure built, we will need big public investment. It seems to me that those who would benefit most from light rail are also the least willing, politically, to support public investment. So, while a lot of people like rail, I don’t see those people explaining how we’ll pay for it. As someone who has paid well into the six figures in income tax alone over the past few years AND heavily used public transportation, I heartily disagree with that statement about political support/public use. I have yet to visit a thriving large city anywhere in the world where public transportation isn’t used and supported by every demographic of its citizens. In the northeastern US, rail lines are used concurrently by industrial (CSX), commercial (Norfolk-Southern/Amtrak), and commuter companies (VRE/MARC/etc), with appropriate agreements. Like you, I would like more data to explain why this would be exceedingly difficult for middle Tennessee. I think the only question is one of identity: does Nashville want to continue to be a growing city, or gamble with its economy by stifling its housing market and clogging its highways? Thank you for your input Ben. A strategy report on light rail will be released in the next few weeks. While it won’t go into detail on funding options, it will lay out the pros and cons of this transit strategy. I believe everyone can appreciate the conventional wisdom: for a growing city with traffic problems, wider roads are a short-term solution; efficient mass transit is a long-term solution. I just moved here from Washington DC, so I know traffic. I know influx. That city moves half a million (!) people into and out of the city every day. The highways are a nightmare during the 3-4 hours of morning commute and 3-4 hours of evening commute. I couldn’t imagine how bad it would be without the commuter train (Virginia Railway Express, VRE), and WMATA bus and metro lines. Over half of the 500k commuters in the DC area take mass transit or carpool. I am currently in a job search, and have already considered the Music City Star as a possible transportation resource here, and will gladly use it to commute into the city if it can efficiently transport me to my (as yet unidentified) new employer. Thank you MJD for your comments. And welcome to Middle Tennessee. I live in Hermitage and loved commuting on the Star. One of the main problems is the limited schedule. To catch the last train out of town, you have to be on the last bus by 5:19. Working a salaried position, sometimes cathching that last bus was impossible. Now that I have transferred to 100 Oaks, there is no way to make it downtown in time for the last train. Adding one more train out in the evening would be wonderful. Thank you Sherise. We’ll be releasing a report on the State of the RTA System this week that explores some of the issues with the limited service of the Star reflected in your comment. We’ll be looking into span of service issues carefully as part of the nMotion planning process. Nashville should look VERY closely at cities (metro areas) that are just slightly a bit larger and take note. IMHO LIGHT RAIL is the solution for the future. Sacramento, Charlotte, Portland, and Minneapolis just to name a few have all invested in light rail which has been a huge success and as I travel for a living I have had the pleasure of using all of them. The real point is that if you don’t offer the public a choice (or semi force it on them by not continually building bigger roads) behaviors will never change. Thank you Dee. We’ll be releasing a report on light rail soon. Please check back for updates. We need a dedicated rail line that is not shared with CSX or anyone else. Nashville has been delaying better rail service (of any kind) for too long now and we continue to drag our feet. A major investment in needed for the long term, not just short term fixes, which will be necessary as well. We need leaders who see the big picture, long term and will have the fortitude to make it happen. I take the Music City Star train everyday to work and have really enjoyed not driving in what is becoming nightmare traffic in this growing city and will only get worse. But I am lucky, I live in Donelson and am lucky my work schedule works with the MCS train, but most others don’t have this option. ( I do the the bus option as well). The MCS train needs to be updated too, I feel like I’m back in the 50’s on those cars. Charging ports, wi-fi on board, etc. would be very attractive, and a step in the 21st century. I also think Metro should encourage all Davidson county residents to use all forms of mass transit, by making it free to all residents. Or you may never get people to use it. Of course the bus system would need to expand to accommodate more hours. Start taking in taxes from MDHA that should be going to the general fund and NOT back into MDHA. I also agree with another comment here that Nashville has it backwards and should have developed mass transit options FIRST, as well as other infrastructures, before all the downtown development of condos and apartments and all. Dedicate light rail should be the way to go, north, east, south and west.If they can fix 8 bridges in 13 weeks, we can make light rail a reality in less time (than 5-10 years), and I know there is much more involved in doing this than fixing an interstate bridge, so lets get cracking! When Portland OR initially committed to light rail trains, they invested 4 billion. Along the routes, 10 million in development occurred.They then introduced the street cars to tie the downtown together. Since then, they have expanded both. Nashville has it backwards, however. We are developing first without considerations for future rail options, leaving it more difficult to add them.There is no need to use the railroad tracks. Light rail is the way to go, particularly coming in from the outlying counties and the airport. As it has been said numerous times, a city in today’s world will not be considered a serious city with out serious mass transit. Portland, Denver, Austin, Phoenix, and Charlotte will leave us behind. And there will always be another IT city. Thank you for sharing your thoughts Lisa. Please check back for our report on light rail which will be released soon. I would say unless you work in the outlying areas of Nashville, then commuter rail is great. I would suggest first changing the Music City Star name to something else, it sounds too business like, mass transit should be fun, so a more updated common name would be nice.Just leave CSX alone and build a monorail with its own stations that serve the outlying counties and suburbs or a subway that goes above and below ground. I would say unless you work in the outlying areas of Nashville, then commuter rail is great. I would suggest first changing the Music City Star name to something else, it sounds too bisiness like, masstransit should be fun, so a more updated common name would be nice.Just leave CSX alone and build a monorail with its own stations that serve the outlying counties and suburbs or a subway that goes above and below ground. I just can’t imagine rail being costlier to build than highways. I was in Denver this June and they make it work and work well along with bus service. Regional and Metro commuter rail lines are needed developments in middle TN. It’s clear that Nashville is growing and swelling with bodies and cars. Working people and tourists look the same sitting in traffic. A denial of expanded green energy mass transit is a pledge of support to heavier traffic jams and more gas burned every day by so many more cars on the road. We need to rip the band-aid off and embrace the a green energy rail line. I grew up in Philadelphia and rode regional rail to and from college and still use it every time I visit home. Cost of gas, environmental cost of burning gas, cost of parking, anxiety of sitting traffic, safety risk > all categories improve, quality of our lives improve with a green energy commuter rail. See you next to me on the train neighbor, rather than sitting in traffic. Please support this healthy development, despite the start up challenges. We’ll thank ourselves later. I currently live in East Nashville and work in Concrete Springs. For me to take public transit today would mean nearly 3 hours of commuting one way. When you are staring at that time for a commute, you get in your own car and drive. There has to be some way – CSX, new lines, elevated train, park-n-ride, etc. to make that not be the reality for folks that live in the urban core and work in the suburbs and vice versa. And waiting for coal to continue to dwindle in demand is too long to figure this out. The current rail lines seem to me to be an excellent start for a commuter rail system. Surely there is an engineering solution to sharing the right of way with CSX. The BRT proposal for West End failed over concerns about congestion, but a rail station could be built at White Bridge and West End which connects right downtown down the existing right of way. If the CSX lines are not available for commuter rail, is there room in the CSX right of way to construct a separate line for commuter rail? I agree with this. We need to think of existing rail lines like we do existing roads. If a road is too narrow we spend the money to widen it. If the right of way for the tracks is too narrow, let’s spend the money to widen it. It’s simply a matter of where we spend our money. Let’s prioritize mass transit over individual drivers in cars. Rail of any kind is very expensive, has long lead times and cannot be changed. Rail is NOT a good option. I lived for a number of years in San Diego which had a rail “trolley” system. It was fast and convenient but it took years for each new line and the impact on traffic was negligible. More buses, more often on more routes. @Bill H, You answered to same rationale for the fact that we cannot afford to keep waiting until planning for distant future transit needs (or burying our heads in the sand), long after you and I have become the dearly departed. Every city which has invested in an advanced-capacity transit system and network, will always continue to have traffic problems, as certain as the atmosphere has air, but the region cannot live on rapid bus alone, as it’s return on investment comes severely diminished and unscalable with moving very large numbers of people (roadway/vehicle maintenance, vehicle life-span [compared to that of rail], operator wages, etc. [for equivalently high capacities compared to rail]). While Nashville and the mid-state region has quite yet to attain such a degree of population and urban density, nevertheless it is approaching those thresholds every so steadily. Rapid bus is great as a short-term solution only. Chicago can tell you that, with its well received Bus-n-Shoulder operations along some of the expressway runs of its PACE buses. I am a resident of Hermitage and cannot use the Star because it only goes downtown and I work in Berry Hill. At one point, the Sub-Area 14 plan called for elevated trains. The route would follow the interstate and it would act as a d’town express much like the Star. The idea was to have a stop at the airport too. I suggest that the place for a terminal is L&N Station in the Gulch. Even with CSX timetables. This is an existing centrally located platform and the old industrial blvd is perfect for cueing busses, taxis, etc. Not to mention the trendy hipness of it and the business it would generate. Perhaps, the old TN Central yards could be used. (The Star goes through there on the way to Riverfront Park), but the L&N is already there. I second the concept of an elevated line. I understand the costs both monetarily and in time consumption. However, there is no time like the present and the improvements to bus lines, which seem to carry the opinion of being a quicker, easier fix, could be implemented during the elevated rail transition. I believe this will significantly help our city as well as our city’s persona. On a silly note, I had a dream a year ago that the pedestrian bridge had two levels. Above was a commuter train and below was a walking mall that was protected from the elements with the above line. This is likely an inconceivable image that my subconscence pulled from living in New Orleans but I just can’t shake the potential for awesomeness in that vision. The first mass transit approach should be an elevated train connecting the airport to downtown. Nashville’s tourism industry is growing ($5 billion in 2014) and is expected to grow more. Visitors would like a mass transit option to downtown hotels. The funds generated by this system could be used to begin the development of other rail or mass transit systems. The commuter rail system used by airports from one terminal to another is wonderful, IMO. Sounds as if rail, other than a possible line to Clarksville, is not a likely option. Obviously, the next best solution would be express bus service. Cheaper and relatively quick; especially if alternative lanes/shoulders are available. There will be new means of mass transit in the near future. The participation of everyone across the region to ensure that the best and highest alternative is being developed for our future needs is very important. MagLev trasit brings about that system to move tens of thousands of people each day from the outlying cities into the city center. The development of this transit system could be in operation within five years and span an 80 mile radius of Nashville, if you want it to be built. I live next to the CSX lines and often have to go on long, very out of the way routes to get around these trains that stop for sometimes hours at a time and block intersections (Douglas and Delmas Ave. I’m looking at you). I don’t think using existing CSX lines is the answer because i’m not sure the timetables could be followed for commuter lines. The Music City Star has been great but only if you live downtown. It is also pretty expensive for mass transit ($10 a day). Most of the people I know in Hermitage and Mt. Juliet would rather drive because of the cost. There is no free transfer to a bus so if you did need to go anywhere but downtown there is the additional bus fare, making it not worth it for most people. Why can’t we do an elevated track system? I understand the cost will be high to build something new, but with the amount of people moving here each day, won’t we have more revenue to use? That’s not true, there are three bus route that pick up Music City Star passengers. I take it everyday to Vanderbilt. He didn’t say there wasn’t transfer possibilities. He said there is no FREE transfer. Vanderbilt pays your fare. There IS the Music City Circuit bus which is free, but still serves only the downtown core & the Gulch. The reliability (arriving on time) of light rail like Music City Star service is a core feature. The pricing needs to accommodate how riders actually need to use it. Example: Live in Wilson county and need to only go one or two stops then have a reduced fare instead of paying all the way to Riverfront. I like the commuter rail solution. I agree our freight traffic is heavy and would be a challenge to interfere, but I’m hoping the right negotiators and vision-seekers can see this through. The other commenters are correct that new rails would be costly and timely, and Williamson County would be a good place to start (I live in Green Hills, but know I-65 S is in need of public transit (as well as 65N, 24 E, etc). Rapid bus service could be implemented more rapidly and would help the traffic situation tremendously – if it is put in the right areas. The Lenox Village area is in great need of this service – in a manner that goes straight up Nolensville Road and not over to I-24 with over an hour ride time to get downtown. A cross town option would be great for those of us who travel from the southeast to northwest corners of the city.